Integrity, professionalism, customer satisfaction - CHECK! Content Chase is America's best online content writing company. With over 27,000 projects successfully completed in a short 9 years of operation, we have perfected the art of custom writing and established ourselves as the industry leaders in SEO article, blog, complete E-book and web-content writing service. 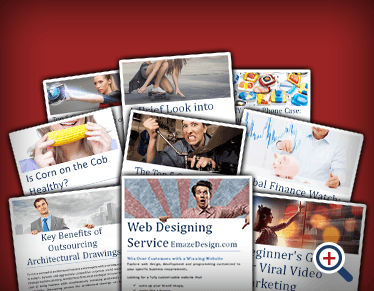 We give you the best comprehensive content solutions money can buy. Our team of highly experienced and creative in-house writers are dedicated to developing keyword-rich content that you always wanted, not only generating traffic for your website but converting visitors into potential customers. Unparalleled professionalism coupled with a keen focus on quality, affordability and customer satisfaction has enabled us to immensely boost our clients' businesses and generate numerous repeat orders. Our supplementary services such as proofreading, online editing and rewriting cater to clients seeking improvements for prewritten content. Clients can also request unlimited revisions for their projects. However, our quality-centric writers rarely give them a chance to do so. Strict measures are enforced to ascertain the authenticity of your content. You are guaranteed 100% unique, plagiarism-free content verified by CopyScape, that you were looking for. You retain control of your project; our system lets you monitor progress and allows for rectifications and/or modifications as and when they arise. We regularly communicate with you to keep you in the loop and ensure everything is on track. Our team of copywriters is extremely flexible in terms of accommodating urgent and special orders. We operate on a 'work for hire' basis, so you are transferred all rights from our content writers, upon completion of your project. 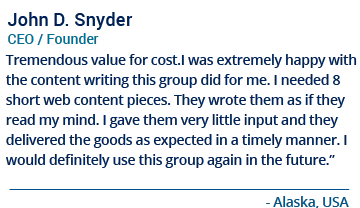 Our customers are our most valued resources. Your success and satisfaction is our reward. So rest assured, you're business is in safe hands because we're the best at what we do.